A dramatic improvement over the original OEM brake. Fits front single disc FX and Sportster® models 1974 to early 1977. 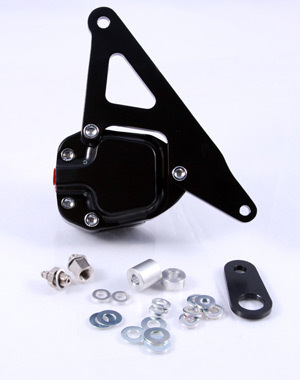 Contains all the necessary parts, including mounting hardware, spacers and bracket. Will require removal of the rotor from the hub and spacing the rotor for adequate caliper-to-spoke clearance. These spacers are included with the kit. A fitting is provided to adapt to the stock brake line. Designed for wheels 19" or smaller. Kit requires a 5/8" bore master cylinder.